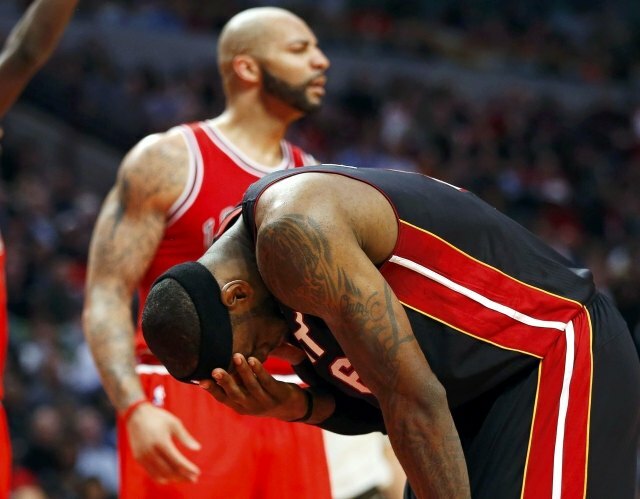 The Miami Heat are now on a one-game losing streak. Have not been able to write that since the 1st of February as the Heat have been on a 27-game winning streak, but that came to an end tonight as the Bulls were able to wake up the offense for the first time since Bush's second term to put to rest those hopes of the team breaking the record of 33 straight that the 1971-72 Lakers set. But it is still the second longest in the history of major professional sports in North America, so there is that. But here is the scary part for the rest of the NBA, now that the streak is over, the Heat are even more dangerous than they were before. Going into tonight, the pressure was on Miami. The pressure was on to continue to win and to break the 41 year old record. Well sooner or later, the team was going to lose, it was inevitable, but that streak was just continuing as the team was coming back from seemingly insurmountable leads and all that. But let's say if the Heat has broken the record, and let's say they had won out the rest of the regular season. Could you imagine the pressure on the team had they went into the postseason with a 39-game winning streak, which would have been insane but would it have been inconceivable? The pressure on the team would have been incredible and the pressure would then be on them to pull off the Moses Malone "Fo Fo Fo." However, now they have lost. Now they are back to earth, there will be no record broken. And now this club, still by far the best team in the East with the best player in the world in LeBron James, can just focus on getting ready for the playoffs and to repeat as champions. Quite frankly, that's it. And that should scare the rest of the league. Who will replace the retiring Tim McCarver?